Will you be consumed by corruption? 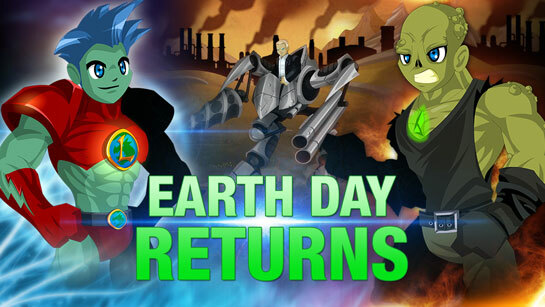 Last week, we celebrated Earth Day, a day where heroes across Lore remember how much the planet means to us. Remember... we only get ONE planet, so if we abuse it, corrupt it, and poison it... we are really short onother options (until colonizing other planets is WAY more feasible). 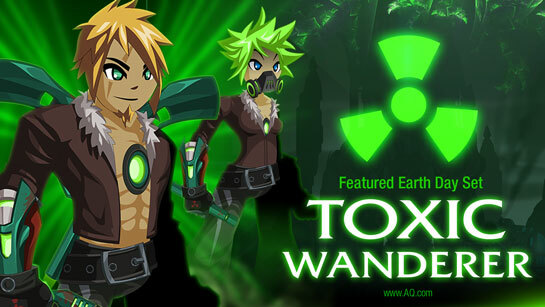 The Toxic Wander is a deadly (but wicked-cool) new set that serves as a warning to your enemies. Find all the set pieces in your Featured Gear Shop for AdventureCoins until April 31st. * This set will return every April as we celebrate Earth Day. There are a lot of benefits to updating our game stories on a weekly basis: we can adjust and re-route our stories as you react and respond to them, increasing or decreasing the importance of characters, weaving in ideas, and telling the tales you want to play. We've kept to that schedule for the last ten years, and it's part of what makes Artix Entertainment games special. Like with any project, endeavour, or undertaking, there are real-world challenges that have to be overcome. That real-world, behind-the-scenes chaos also has an impact on where the story goes. Especially one that updates on the kind of schedule we do. 1) We have a much smaller window to react in -- whether it's to unexpected staff absences or a flood of feedback. 2) We have to get it right the first time, as closely as possible. (So when we have to, on the fly, take the story in a new direction, one we don't have a long-term plan for, it adds even more challenges to our writer and her Lore-Crew). To be clear -- there's no blame here. Memet (our lead writer), the team, and I can tell how much you care, and we LOVE that you get invested in all our characters. We care about what you want, and your feedback. 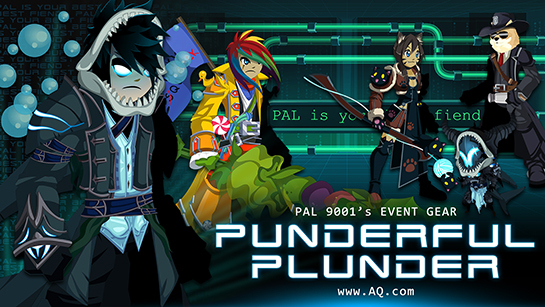 We always want to take that into consideration because we are making AQWorlds for and with you. If we see we're doing something you guys don't like, we can (and do) change direction. That can -- and has -- had the side-effect of making the story we planned to tell feel less cohesive. We've never shied away from tackling big projects, but in hindsight, there is a lot we would have done differently with the Queen of Monsters' saga. Part of the goal of the Queen of Monsters' finale is to rectify that, putting to rest the fragments of the story we started and introducing a new main story with more built-in room to change courses (whether that's a slight turn towards Swordhaven or a 90 degree turn towards Elemental Planes we've never entered). And to that end, as a team we've done a lot of analysis about what we can do to prevent some of the pitfalls and downturns from the Queen of Monsters saga that weren't as well received. We're committed to moving forward with our weekly updates on the web (as long as feasibly possible), and to evolving our world and its story, because that's what you want, and what we want to give you. Lord Balax'el is a scion of the Darkness, leader of the Infernal Army fighting under the banner of the Queen of Monsters fulfill her goals. For those who aspire to be like him, you're in luck! 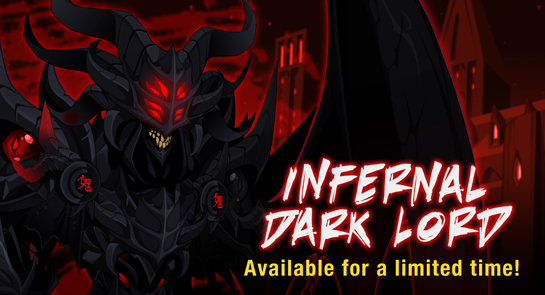 The Infernal Dark Lord armor set is back in the Featured Gear Shop! April is the month of WAR! The world of Lore is never peaceful for long... and the battles that lie ahead of you are only going to get more intense. Embrace your fate (and a future full of combat... literally*). 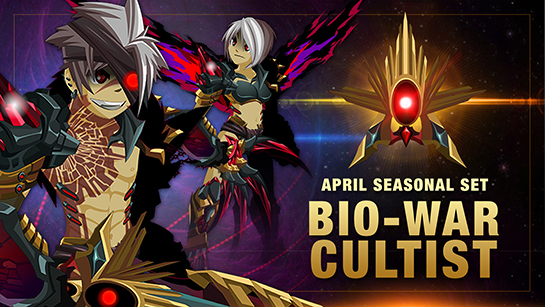 This month's seasonal set will outfit you for the coming conflict: the Bio-War Cultist. * The Goddess will be pleased. She favors her devoted Cultists. The total cost to buy all of the gear individually is 4,000 ACs, so getting all the gear from the pack is a pretty sweet deal (you save 2,000 ACs). ** The character page badge will go live in the afternoon on Monday, April 1st. May - August: ??? - come back to see what we'll bring! Is this the same as an upgrade bonus? Upgrade bonus gear is an extra reward for buying AdventureCoin or Membership packages; new bonus gear comes out roughly every month. Seasonal set packs are bought separately. Just like the Flame Dragon Warrior pack, you can buy the entire set directly, for one price, on our site. You can ALSO buy the individual pieces in-game. This set will return EVERY April, so if you can't get it now, you'll have another chance in 2020, or 2021, or 2022, etc. If this isn't a new upgrade bonus, what IS the next bonus? 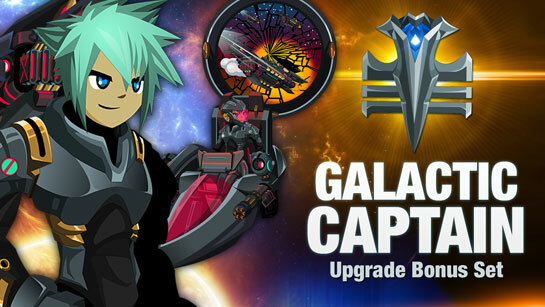 You can see all the available upgrade bonuses on our upgrade site. The next bonus set will be available soon, so keep an eye on the Design Notes! You're in luck! 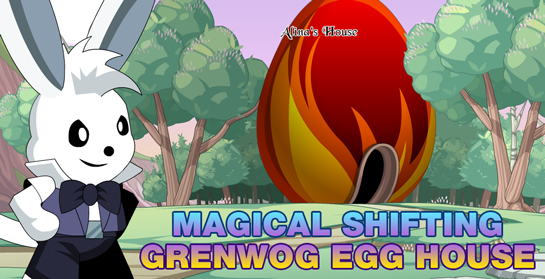 Talk to Garek in Battleon. He'll be selling the individual pieces of the set through January 31st. 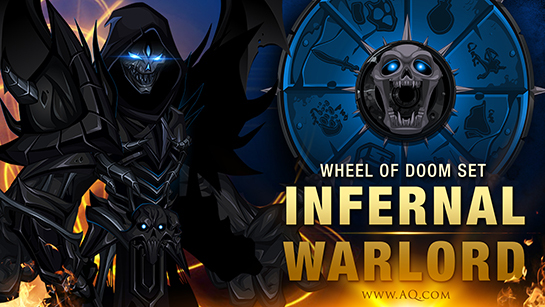 The Wheel of Doom spins round and round... and this week, as we prepare to enter the month of WAR on Monday, we've got an all-new set of gear for you -- the Infernal WarLord! 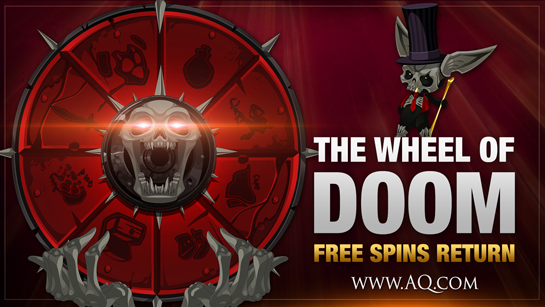 We know a lot of you are raring to redeem your free spins... so we're adding a full new Epic rarity set for you, crafted by AQW Artist, Crulon! 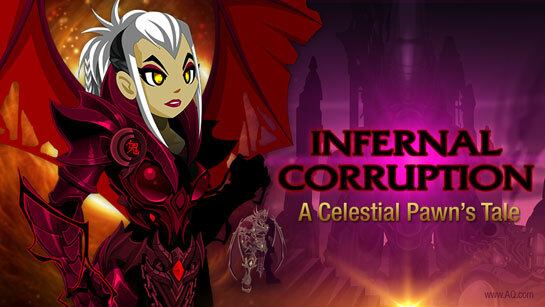 Each piece of the Infernal Warlord set will be available from the Wheel of Doom and from the Doom merge shop. The PIoDA currently stacks up to x5. "Shadows run when a good Hero goes to war." If March was the month of Evil, April is the month of... WAR! Get your /party on as we celebrate the real-life Thai New Year with a micro-war in Bloodtusk Ravine before beginning the year-long Queen of Monsters' finale saga with the War of Shadows. As March draws to a close, we've got a melange of things you need, want, or should know before we move into April. 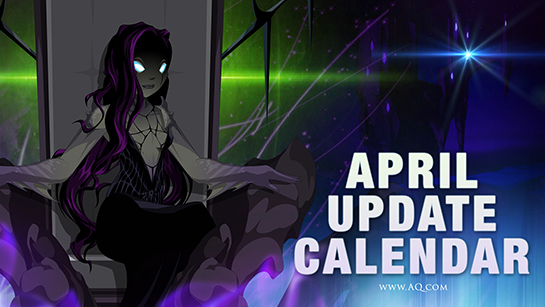 Read on for news, and then come back tomorrow for the April release calendar! Keep an eye out for emails claiming to be from ArtixHelp@gmail.com or Boacompra@gmail.com -- these are not legitimate emails from Artix Entertainment or Boacompra (a Brasilian payment provider). Legitimate emails from Artix Entertainment and Boacompra do not use @gmail.com or other public providers. 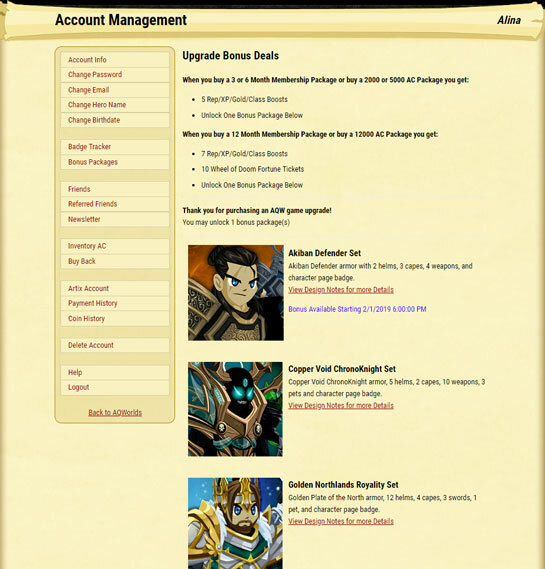 If you ever have questions about whether an email you've received is legitimate, please contact the Artix Help team through our Support Pages. 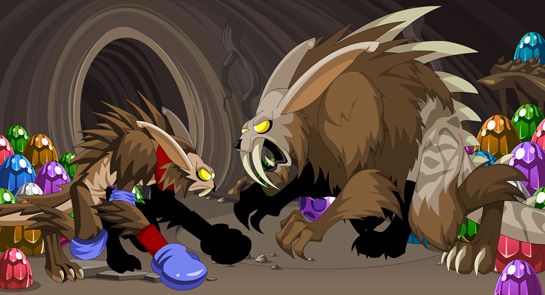 March is our Month of Evil, and brings with it Dage the Evil's birthday, the Lucky Day Fair, and more. All our limited-time March events will leave for the year on Friday, April 5th. 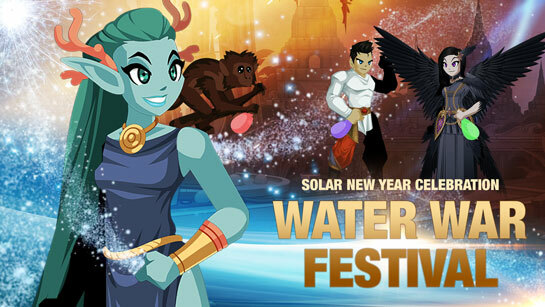 Our March seasonal set, the Legion WarSeeker, will leave at 12:01 AM EST on Monday, April 1st. 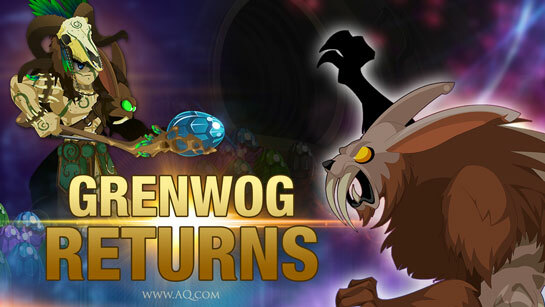 It will be replaced by the Bio-War Cultist set, crafted just for you by AQW Community Artist, Noire. Exclusive Undead Legion weapon update: @DageTheEvil has not forgotten about the weapon he is crafting just for his loyal followers. The estimated release date is the first week of April. Keep an eye out for previews in the near future. (New) Server Rewrite: Update announced in January. 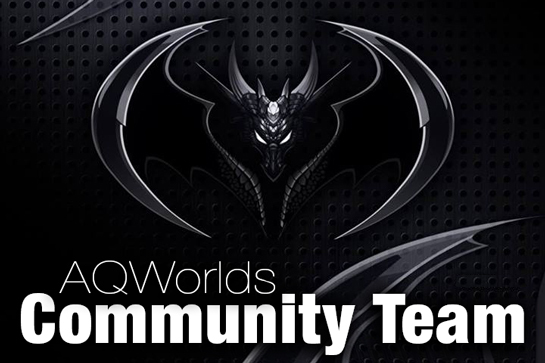 The new server will be used for AQ2D (or whatever it's true, final, for-real name will be), but will not release for AQWorlds (the web version you play now). Monster Hunter Class This class is no longer scheduled for release on the web. Decreasing Username Cap Limit Good news! After meeting with Captain Rhubarb and Nythera last week, implementation plans are in place to allow you to change your character name to one with 3 letters. (Included in the plans are a few new, additional account security measures Captain is adding.) Keep an eye on future Design Notes for more updates. Chaos Saga / Other Area revamps Based on your feedback, we will continue to do these, but as time allows rather than one every month. I had wanted to do these myself, because I think they're a very fun idea... but the universe has a way of interfering with plans. My schedule has changed enough to make this unfeasible for the foreseeable future, so I reassigned the micro-zones for last year's Achievement Tracker classes to another designer. Work on them is currently in the planning stages. Earlier this week, the team added a 0 AC tag to the Classic Alpha Pirate Class. If you are one of the original heroes who received the class back in 2008 (during the 1st Mulligan Day) and no longer have it... GOOD NEWS! Yorumi is adding the class back to your account yesterday. If you do not see your armor on your account, hang tight. We'll be adding the rest in today. 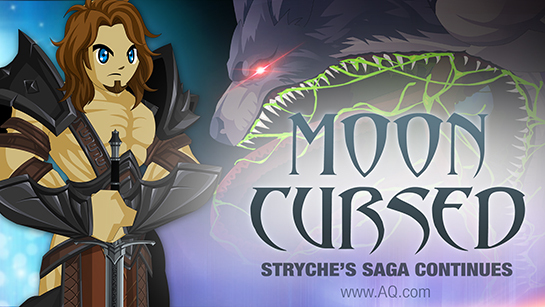 This weekend, enter the Mooncursed Lair as we continue Stryche's battle to save his people! Marchosias, the rebellious leader of the Mooncursed Warriors, is still free to threaten the lives of the Hunter's Moon Clan. To defeat him will require skill, sacrifice, and a moon-forged weapon strong enough to cut through Marchosias' madness.But there is more to Voland's curse than we know, and if you're not careful, one of your closest friends may lose himself... forever. Stryche, Warrior and the owner of Battleon's HeroMart Store, has been your friend and fellow defender of Lore for years. This weekend, explore his past and join in the fight to defend his home from Marchosias, a rival warrior who'll stop at nothing to take control of the Hunter's Moon Clan. 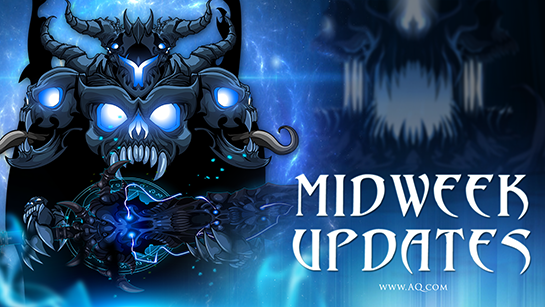 What happens when Dage's birthday is followed by a ShadowScythe story? The most EVIL crossover! This set is an Undead Legion twist on the ShadowScythe General art. 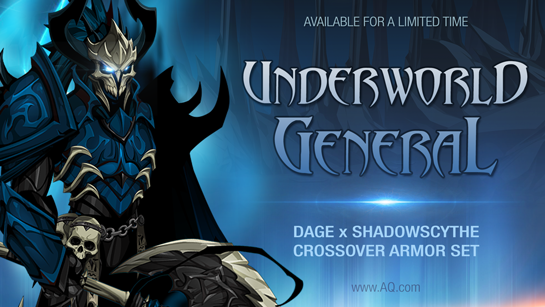 Find it in your Dark Caster Collection Chest for free or Dage's Birthday Shop for AdvenureCoins for a limited time. Earlier this week, we released a surprise for all you heroes who want armor versions of your favorite classes. And tonight, we added even more! 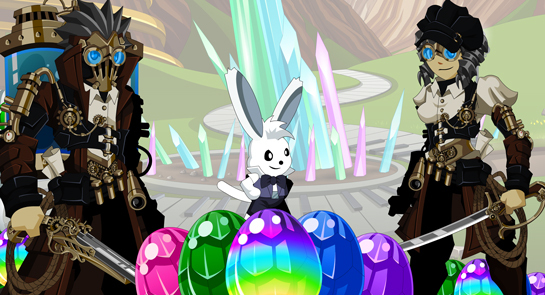 Find the armors in their class shops, with the exception of the Chunin, Darkside, and original DoomKnight armors. If you have those classes, you'll find quests to get the armors in the Battleontown Curio Shop. Unlock the majority of the classes listed above, the Chunin and Darkside Classes are no longer available, so the armors have been added to quests, and the classes are required to unlock them.